How do I use Tidymail ? _submission._tcp        IN      SRV 0   1       587     post.tidymail.co.uk. _imaps._tcp             IN      SRV 0   1       993     imap.tidymail.co.uk. _imap._tcp              IN      SRV 10  1       143     imap.tidymail.co.uk. _pop3._tcp              IN      SRV 30  1       110     imap.tidymail.co.uk. _pop3s._tcp             IN      SRV 20  1       995     imap.tidymail.co.uk. Unfortunately there is no auto-configuration mechanism for Android, but we have setup instructions. And the Firefox plugin DNSSEC/TLSA Validator seems happy. 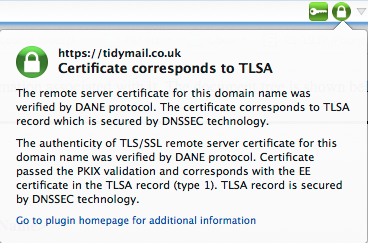 And once we had DNSSEC in place it was but a small step to DANE TLSA records for everything.